Backyards have personalities just like people do. Some are boisterous and dramatic, others are quiet and peaceful. 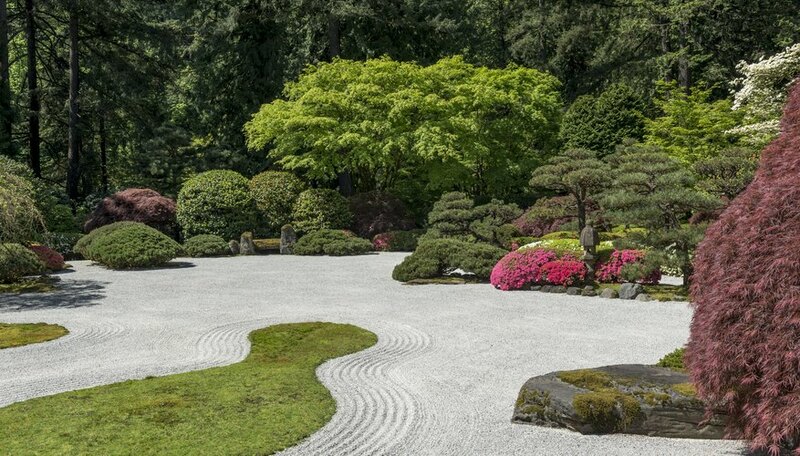 If yours seems too showy for your current frame of mind, it may be time to look at other options, like Japanese gardens. 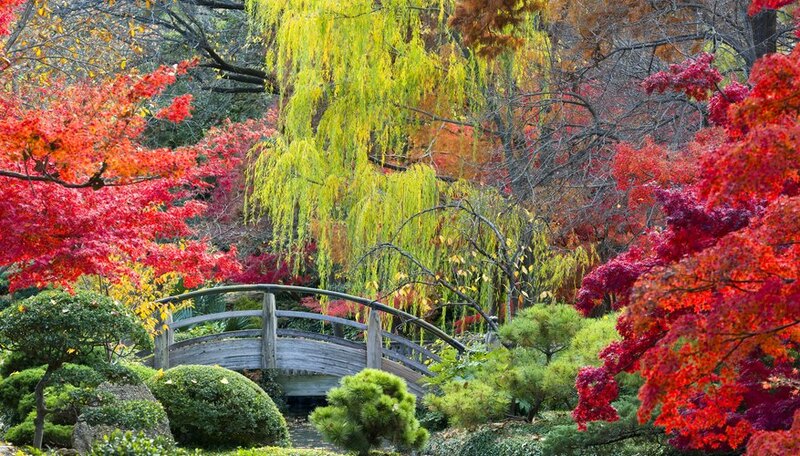 Japanese gardens are created as sanctuaries, islands of tranquility and reflection in a busy world. You can add a touch of peace and mindfulness to your own garden by using some elements of Japanese gardens in your own. With winding pathways and a monochromatic landscape, Japanese gardens invite you to slow down your thoughts and stay in the moment. These gardens encourage visitors to breath deeply, disconnect from worldly worries and direct their thoughts inward. Japanese gardens often focus on textured, foliage plants in different shades of green, rather than the fireworks of bright flowers. They also include a central water element, like a pond that reflects the nearby trees and shrubs and that may be home to fish and water lilies. 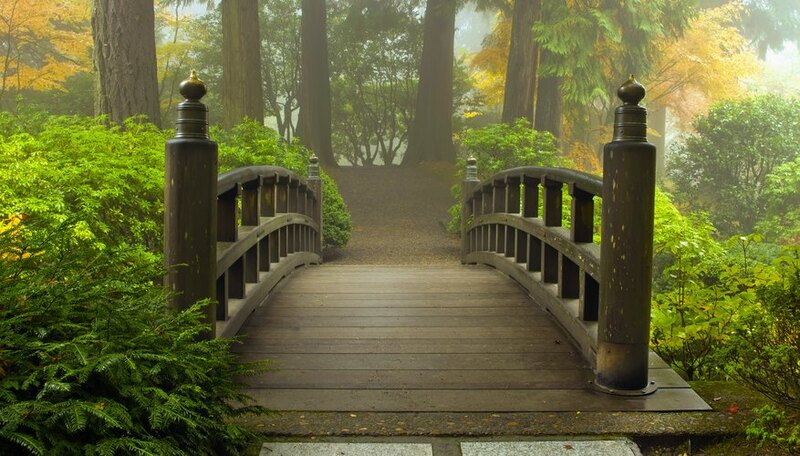 The pathways in a Japanese garden are important. They are often constructed of separate stepping stones that force a visitor to pay attention, carefully placing a foot first on one stone, then the next, to stay on the path and in the moment. The pathways meander around the garden, never running in a direct, efficient line from one point to the next. As the path turns, it offers different views of the landscape, surprising perspectives that carry innate delight and wonder. These might be a carefully placed stone lantern framed by delicate trees, a beautiful display of stones on raked ground or an unexpected view of a small waterfall. The idea in Japanese garden style is to create vignettes that can only be viewed one by one, by tranquil exploration. The pathway's curves – and the sound of moving water just around the bend – beckon the visitor to explore the mystery of the next vista. Japanese gardens rely on subtle differences in plant color and texture to hold a visitor's attention. Japanese garden plants traditionally include dwarf conifers that provide varying shades of green and gray-green all year round. The conifers bring a feeling of age and stability to the garden. Some reflect the pyramidal form of a pagoda, while others provide texture with their low, spreading branches. The Japanese black pine (Pinus thunbergii) is one of those often seen in gardens, with its long bundles of dark green needles. Japanese maple trees (Acer palmatum) are frequently among the plants installed near a water feature in a Japanese garden. With their deeply-cut, lobed leaves and elegant, rounded forms, Japanese maples are doubly beautiful when reflected in a still pond. One cultivar to try: ‘Sango-Kaku’, with its delicate pink-tinted green leaves that turn a glowing yellow in autumn. For ground cover in a Japanese garden, consider using green mondo grass (Ophiopogon japonicus) or black mondo grass, (Ophiopogon planiscapus). These plants are traditionally used to create texture and to please the senses, as the long grasses (some 12 inches) ripple in the wind. You might also use moss and place stepping stones across it. For slightly different and unusual green foliage, include Siebold's wood fern (Dryopteris sieboldii), with its long, arching, leathery leaves and love of shade. This useful textural plant looks very attractive grown against stone.